Bourbon rose. Classified by Rivers as a Hybrid Bourbon rose. 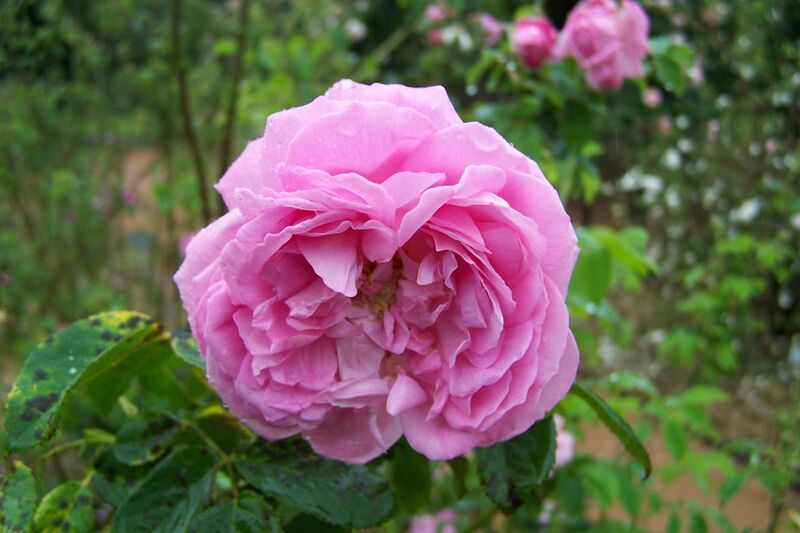 These were distinguished from the Bourbon rose by Victorian writers not only because of the parentage, typically Bourbon roses crossed with summer flowering roses, but because they follow the flowering character of the summer-flowering parent, i.e. they are summer-flowering only. In the opinion of Rivers ‘Coupe d'Hébé’ ‘is the gem of this family [Hybrid Bourbons]; in colour it is of a beautiful wax-like pink, and in the disposition and regularity of its petals it is quite unique: this, like most of the group, soon forms a large bush or tree, and is also well adapted for a pillar rose.’ [Rivers (1854, 1857, 1863)]. In my garden it produces an excellent spring flush but is thereafter barren of flowers. Introduced by Laffay in 1840. It was also described as a good pot rose, and in 1856 designated ‘the ideal rose’ by William Paul writing in The Gardeners’ Chronicle. [Gard. Chron. 1847, 1856, 1858]. It was figured in the first edition of The Rose Garden. [Paul (1848, 1863, 1888, 1903)]. In the first great National Rose show held in July 1858, ‘Coupe d’Hébé’ featured amongst the roses appearing in multiple (10) winning collections. Listed in the 1850 and 1857 catalogues [T.877/1850].